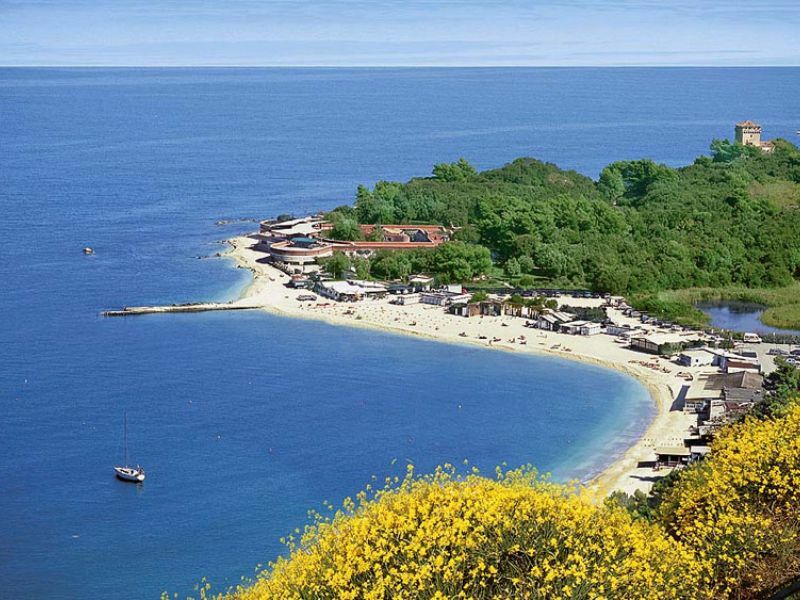 This is one of the most evocative places on the Adriatic coast: Portonovo. a monument of an unjustifiable forgotten past. Southbound you would expect a ridge similar to the previous, with the city instead of the villages upon the hills of Pesaro, but it is after the Passetto that you begin to understand that the hill is going upwards, you get rid of blocks of flats from the Sixties with view over the sea. There the air changes, you enter the perfumes of the park, among broom tree brushes and lavender fields. You definitely do not expect such a place, foreigners wrongly see the coast of the region Marche as a northern extension of the coast of San Benedetto del Tronto, the legendary Riviera of the Palms, an “alter ego” to Rimini Riviera. On the contrary, the territory of the region Marche shows that no place – nor language and way of thinking – is similar to any other, it might be described as a surrogated Italy with its landscape that includes the Alps and the Oranges of Sicily, there you can swim looking at the sea. Also the culture is varied, from the Picentes to the Romans, from Byzantinum to Barbarossa, from the Renaissance of the Montefeltro, from Napoleon to the anarchists. The people of region Marche come together under the smell of an underrated contemporaneity, nothing really happens but everything changes, which is typical for those who don’t want to show off, but in the end they are always first in line. The metamorphosis has taken place. 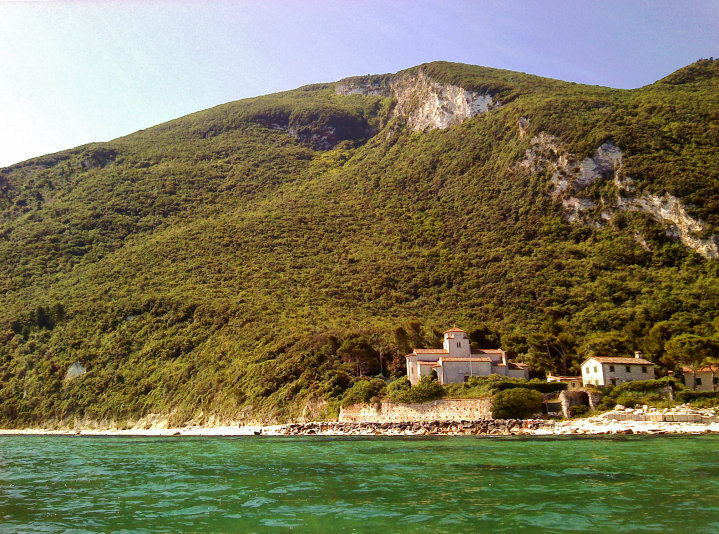 Mount Conero raises on the background of a vision that comes from the East, dense in light and Portonovo opens itself as a shell to unaware viewers. A double surprise, since you understand that this is first of all an historical place, even though the sea shines between wind-surfers and motorcycles speed along the way, roles are mistaken and may even let romantics walk away, among beach umbrellas and sandals, you can reach the Tower of Bosis, and in case you can park your car, the Romanesque church hidden among the woods. 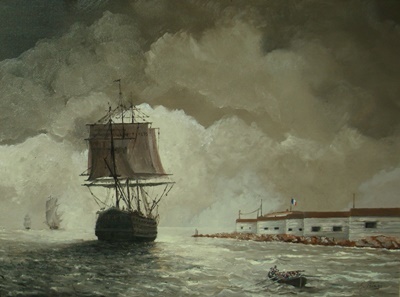 Santa Maria in Portonovo where monks came here to find shelter from barbaric winds, forgetting the corsairs, so that cenobitics retired from the Central Pennins, leaving this stunning church intact in its beauty and signs, during the Summer there are several happenings surrounding the Christian temple, thanks also to the events arranged by Fondo Ambiente Italiano and Italia Nostra. 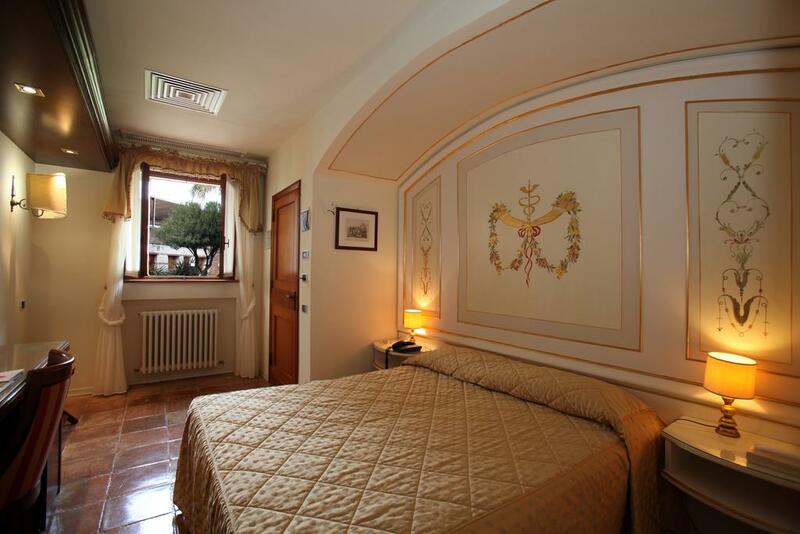 If you spend your holiday at the Fortino Napoleonico, you can enjoy the heart of the place, avoiding traffic jam on the road and on the shores. 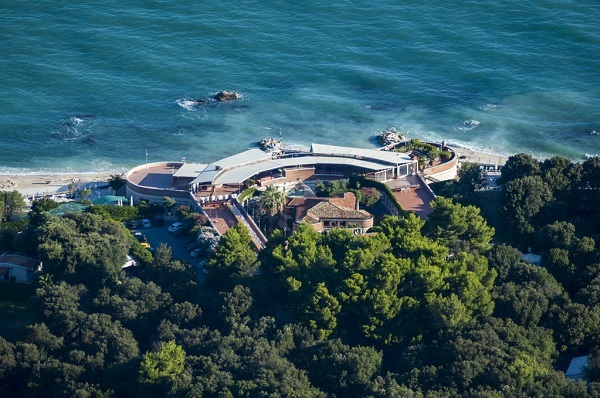 This is the third historical place of Portonovo, with its hotel and restaurant, well-finished by the second generation of owners who during the Seventies turned a ruin into an accommodation facility with good taste and renovation sensitiveness, that is unfortunately not common. 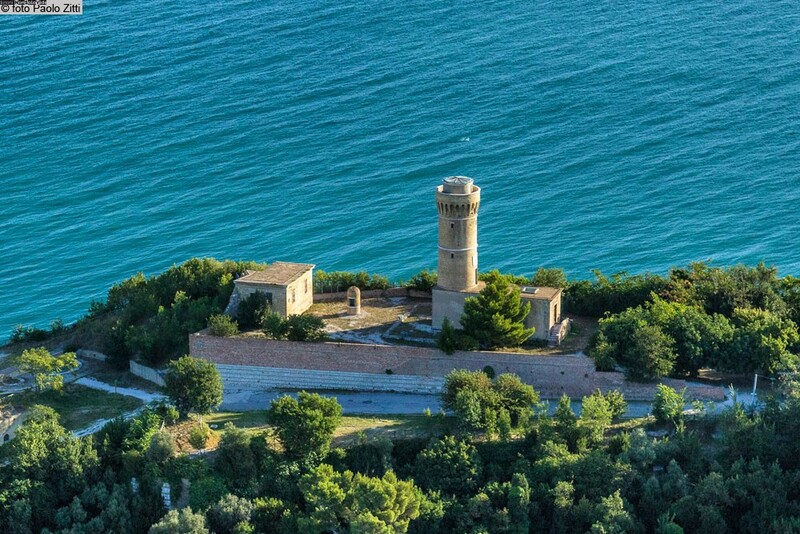 Inside this beautiful exemple of French military architecture, immersed into the woods, but less than three meters from the shore, you can find elegant and quiet rooms, furnished in accordance to Napoleonic style – the emperor visited twice Ancona and left several signs. In the courtyard there is a second building , probably used as control room, today turned into a restaurant with high wooden A-framed ceilings, and an evocative central fireplace. Spending your time in this place, also for few hours, is like time travelling: you breathe a different atmosphere, quiet and cozy since the area is completely fenced in and covered by woods. The magic of this place is probably due to the stones used for building. There’s a story about the stones that were taken by a ruined nearby monastery, close to the romanesque church, where also Saint Pier Damiani lived and even the poet Dante Alighieri passed by. For this reason the place is beloved by artists and poets. The entrance itself is well worth a visit, the long holly oak tree-lined avenue introduces into the spell, from Spring onwards you can see undisturbed ducks flying on the fields of the hotel, coming from the nearby lake: indeed, the fort was built to avoid that English ships would stop to stock up drinkable water. 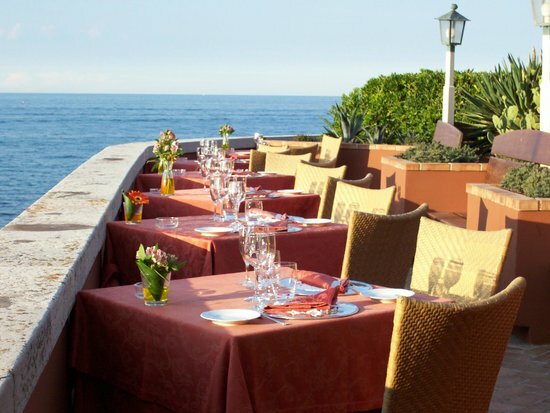 The restaurant uses top quality products and the cuisine is high level, but also traditional dishes are prepared. You can enjoy the traditional Spaghetti with “moscioli” of Portonovo, or maybe stockfish with potatoes, made in accordance to the old recipe of the Academy of Ancona. There’s also a good selection of Cognacs, Whiskeys, Rums and Cigars. In the “Sala dei Marescialli” with its stunning central fireplace, the area is so large that it could host any kind of event and special party. Service is excellent, personnel is qualified and polite. During the summer you can have dinner upon the fort with a stunning view over the bay and the sun at dusk, listening to the piano. Customers of the hotel can use beach chairs under the tress over a large area of the park, with its green grass, a bar / restaurant area in front of the shore, which is preserved for the hotel guests. The sea is bright and immediately deep, typical in this area with rocks and stones. 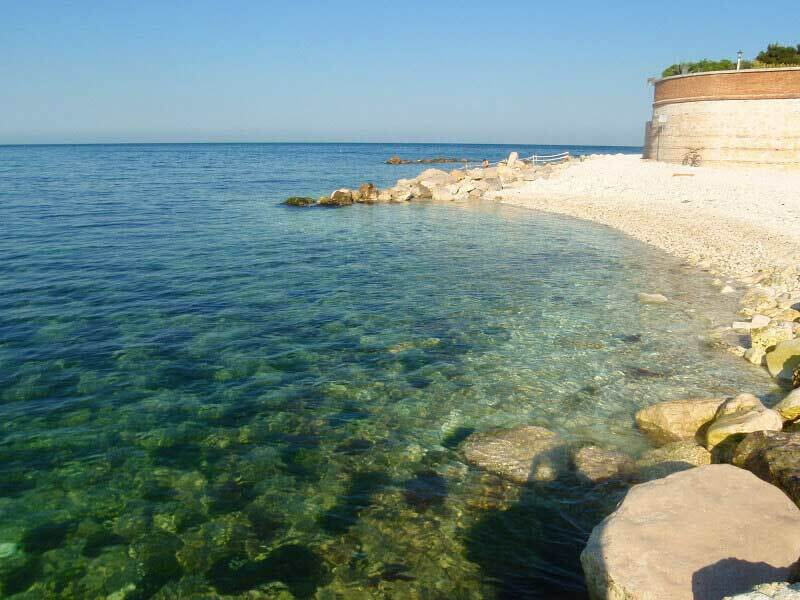 Nearby you can rent canoes or rubber boats to visit several shores, among them the shore of “Due Sorelle”, so that you can enjoy at best the sea which is particularly clear.